The unification of the old and the new, and the use of modern techniques to explain the historical past - that's what the National Museum of African American History and Culture and Bunch, its founding director, are striving for when the newest Smithsonian museum opens on the National Mall this week. President Barack Obama will help dedicate the museum on Sept. 24. "This is an opportunity to take an amazing culture, and understand what it mean to be an American through this lens," said Bunch. He spoke as he toured observers around a special sneak peek inside the building. The museum is designed to take visitors through African-American history in the United States from slavery, on the lower level, to a reproduction of Oprah Winfrey's television set upstairs and artifacts from Obama's first presidential campaign. The slavery exhibits are in rooms with small cramped walls to simulate slave ships. Also, there are pieces of an actual slave ship. It is, the São José-Paquete de Africa, which wrecked off the coast of South Africa while carrying more than 400 enslaved people from Mozambique. The slave cabin is from the Point of Pines Plantation on Edisto Island. It is one of the largest exhibits and was dismantled and reconstructed piece by piece inside the new museum. 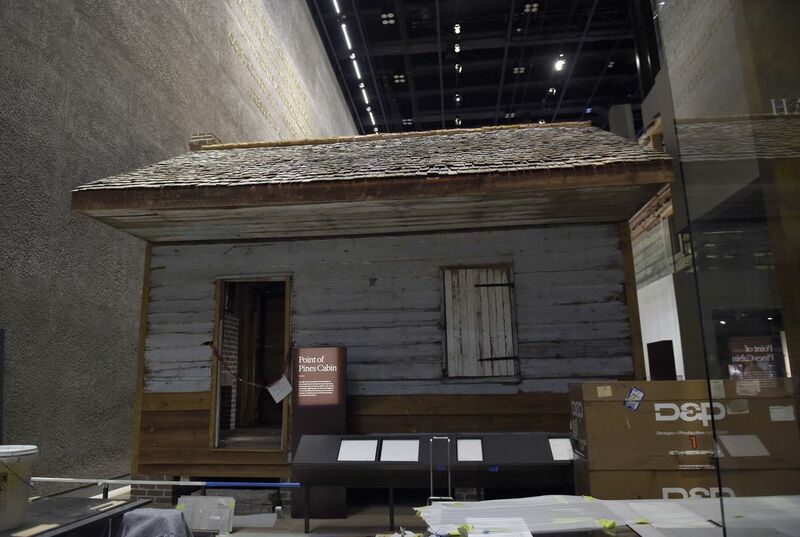 While the names of the slaves who lived inside the cabin are unknown, Bunch said the exhibit is a good way to help humanize the people who lived through slavery and to help explore the meaning of their lives. When Bunch led a group of journalists around last month, wires and exhibits were still under construction: Parliament Funkadelic's Mothership was completely covered, although its distinctive shape was instantly recognizable. A Maya Angelou quote placard "I am the dream and the hope of the slave" sat on a table waiting to be affixed to a wall along with quotes from Obama, Nikki Giovanni and Black Lives Matter founder Alicia Garza. And the playbill announcing Ira Aldridge as the first black man to play Shakespeare's Othello in 1857 in England was hidden behind brown paper on the wall to keep it safe. But history can be seen even from the shape of the museum, Bunch said. 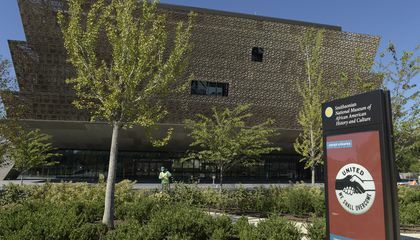 The bronze exterior of the building is actually a latticework based on historic ironwork created by African-American slaves and freedmen in the South, which fits into their goal of emphasizing the hidden history of African-Americans, Bunch said. For example, in the comedy exhibit right alongside quotes from famous black comedians such as Richard Pryor and Redd Foxx is a joke by Bill Cosby, the first African-American to star in a dramatic show on network television. Cosby faces allegations that he drugged and molested dozens of women over five decades, and the 78-year-old comedian has been spending millions in an aggressive bid to salvage his reputation and avoid legal judgments that could threaten his fortune. The point of a sneak peak is to only review some or a little information to spark the interest of those that might want to attend it. By only revealing some parts of the new museum, people may want to learn more about black history after only seeing highlights of it. This is a common sales tactic to bring in more customers.